This CD is a follow-up to Last Call at Cafe Alto which featured alto saxophonist Turner and the jazz compositions of Richard Karmel and Steve Rosenbloom. 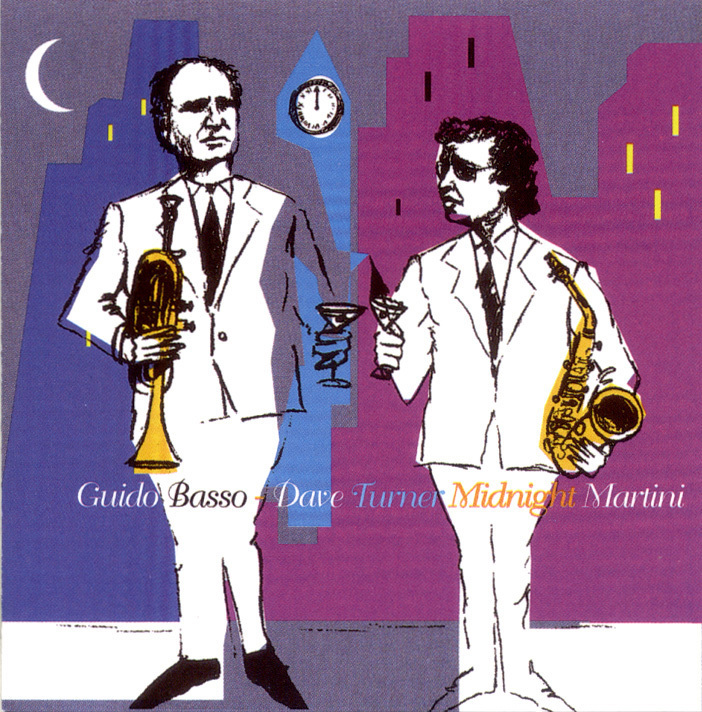 Flügelhorn master Basso joins Turner, and they make about as engaging a front line as you'll find in mainstream jazz. Turner's highly technical abilities mesh with a fluid, singsong, lyrical approach, while Basso is about the warmest brass player in Canada, maybe anywhere. The rhythm section comprises the wonderful guitarist Roddy Ellias, bassist Fraser Hollins, and drummer Claude Lavergne. On this 11-tune program, ballads and slower tunes are predominant and peppered throughout. In most cases, as the title track and Alan Broadbent's waltz "The Long Goodbye," Turner and Basso play separately, taking turns. They do play together at the intro and outro of "Lou's Lament," and leave plenty of space for Ellias' emotion-laden guitar to patiently weave spells. Another "Waltz for A.B." dedicated to Broadbent continues the Haunted Heart/Quartet West thematic similarities. Some of the dedicatory pieces are so subtle; "In Walked Monk" is based on an inspiration from Thelonious Monk's "In Walked Bud," and sounds so simplistic it is closer to a Count Basie riff. "Count Me In" is a more complex calypso. "African Heat," inspired by Dizzy Gillespie's "A Night in Tunisia," is a light samba with some nice unison lines. "Spunky," with references to Cannonball Adderley and Art Blakey, comes out swinging in midtempo fashion with a dramatic melody, and another fine guitar solo by Ellias. Basso plays harmonica on the ballad "To Gerry" as beautifully as Toots Thielemans might, while the closer, Latin burner "In Search of Senor Charles," and the bossa "O Feitico Dela" harness the most energy, and create the most memorable tension-and-release aspects of the session, again Ellias shining in the middle of the action. It's clear that the playing is stronger than the compositions, solely due to the competence of Turner, Basso, and Ellias. In a club setting you can bet they're dynamite, but on CD, they're more restrained, and that'll be fine for cool school heads and those who like their jazz with wisps of steam.